Item excluded from Free Shipping! Plants are able to much more easily derive a benefit from Flourish Iron than from EDTA-iron sources because all EDTA iron is in the ferric (Fe+3) state. Since plants require iron in the ferrous state, additional physiological energy must be expended in order to extract the ferric iron from EDTA-iron and then convert it to the ferrous form. Contains no phosphate or nitrate. Use 1 capful (5 mL) for each 200 L (50 gallons*) or as required to maintain about 0.10 mg/L iron. For smaller doses please note that each cap thread is about 1 mL. Use MultiTest: Iron test kit to monitor iron concentrations. 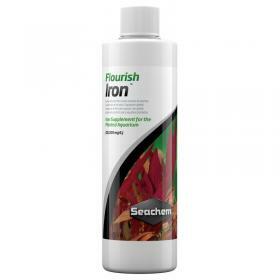 Use as needed to combat signs of iron deficiency (usually seen in new growth) which include: chlorosis (yellowing) of tissue between veins and short and slender stems.